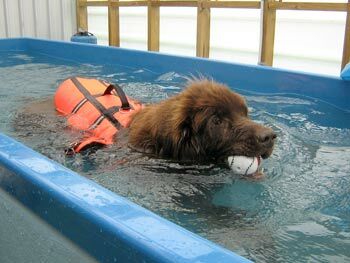 Dog swimming questions, why bring your dog or puppy swimming in Christchurch? A session is 30 minutes. The first swim is only $30.00 for one dog, so that you can see how much your dog enjoys it. Regular swims are $35.00 per swimming session. Two dogs (at same time) $50.00 per swimming session. How does my dog get into the pool? There are large, gentle sloping ramps or we can lift your dog straight into the pool, depending on your individual canine's needs. Do I need a vet's recommendation? If your dog has undergone surgery, is recovering from an injury or has a known complaint you should check with your vet if it is okay for them to swim. We do ask that dogs are vaccinated for the health and safety of all our users. 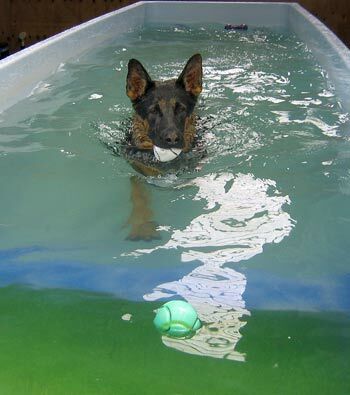 We offer the first session for only $30.00 so that you can be sure swimming suits your dog. We find most dogs enjoy it and can't wait to get in. We supply towels for your dog's session. Can I bring my two dogs - they do everything together? You're welcome to bring your two dogs who are used to playing & exercising together. Are you open on a Sunday? We're sorry but we're not open on Sundays. Do you know of anyone who does canine therapeutic massage and healthy doggie treats? Yes, try Kathleen at www.balanceddog.co.nz. See pikkies of Zara having a bit of tlc in our photo gallery. Zara having a massage..
Did you know, that some dogs pancreas don’t function properly, and they can lose weight rapidly while still eating normally. We have found out this first hand, and it is called Exocrine Pancreatic Insufficiency (EPI). We had never heard of this before but it is fairly common. We have found this website to be very helpful. Check them out.www.epi4dogs.com. A recommended read and funds going to a good cause. (The author's dog George, enjoys a swim here) www.quakedogs.co.nz. Dr Jane Newman is now working to help abandoned cats in the red zone. Please check out her website to see if there's anything you can do to help www.redzonecats.com. My dog was facing an expensive operation but after several months swimming we found this may be no longer necessary.